In this book, Cantrell addresses many hot-button topics that plague our world today. The author wrote with raw emotion, which drew me deeper into the story. Whether or not I have faced the trials presented on these pages, I could relate to the characters as a child of God, a woman, a daughter, a wife, a mother, a friend, a working professional, and of course, a chaperone. Through various plot twists, I forced my eyes to read on because I was invested in the lives of these fictitious characters, and I wanted to see if and how they relied on their faith to get through the darkest of days. I chose to highlight this book here with the hopes that the story’s message may shine light in the darkness for readers who are feeling their way through the shadows of life. 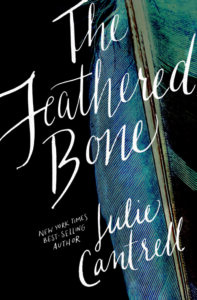 The book’s back cover reads, “The Feathered Bone is Julie Cantrell’s master portrait of love in a fallen world.” And it’s true. We live in a broken world where darkness seems to grow with each passing day. But where there is love there is hope. I cling to this hope and my faith in God’s promises. Wishing you and your loved ones many blessings.